Hi everyone, it’s time for a very colourful outfit. I’ve mentioned many times before that I find it interesting to see the way in which outfits come together; I often end up pairing pieces together which I acquired around the same time but may not necessarily have put together otherwise. This is definitely the case with this outfit. The dress is one of the pieces which my friend had made for me in Hong Kong and the cardigan is a recent DIY/customisation project. I have very rarely, if ever, seen anyone wear this colour combination; it makes me feel like I could be a presenter on the children’s television show. I absolutely love this dress and, being a completely different material, I hope it’s different enough to the green velvet version which I posted here. Orange has been such an underrated colour for me up until recently. I used to hate orange and, as a result there is very little orange in my wardrobe. 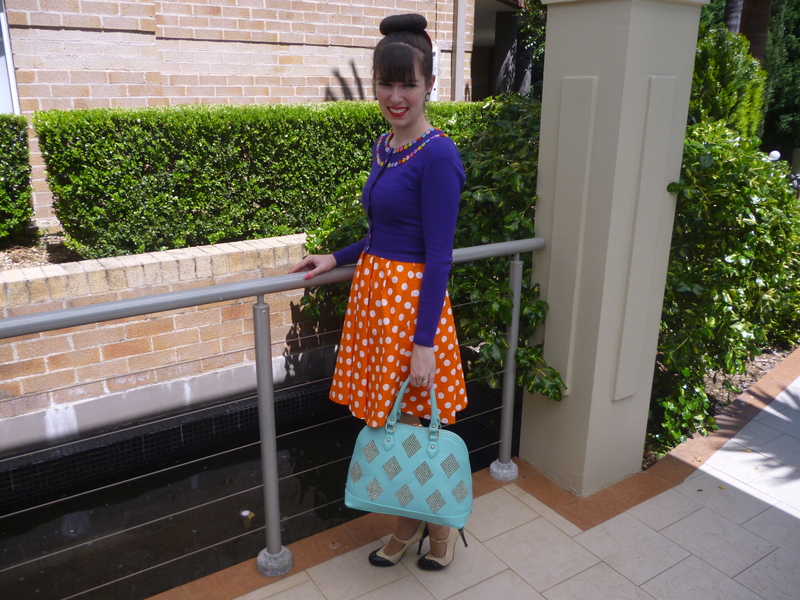 This is my second orange dress and I have an orange bag but a pair of orange shoes would be pretty cool. I love that orange is bold and makes a statement. It’s great that it’s such a happy and positive shade. It’s like my relationship with yellow. I hated yellow until last year and now it’s one of my favourites colours; it’s becoming like that with orange too. 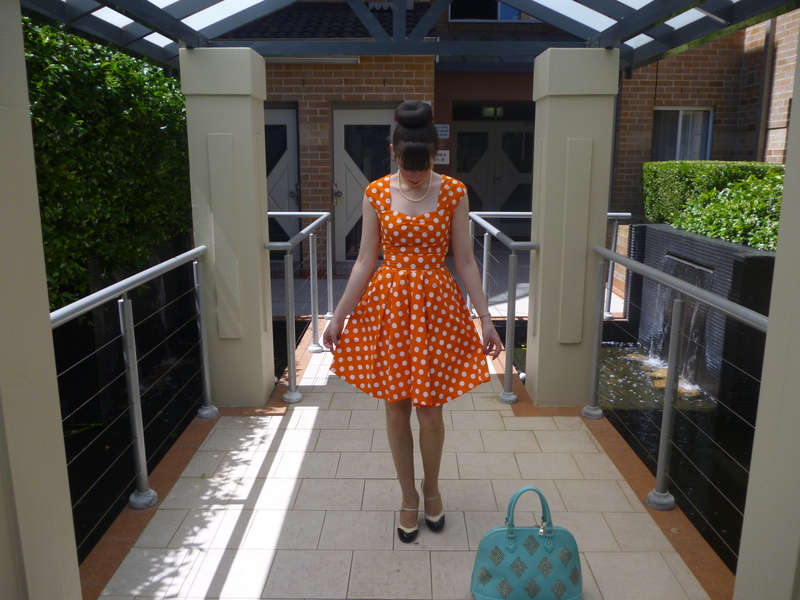 The other reason why I chose orange polka dots is because I almost bought a dress of that description not long before I had this one made.. It was really exciting to receive a piece which I so desperately wanted. I’ve been interested in sewing lately; not making clothes because that would involve too much effort and skills which I don’t have. However, I love adding beads, buttons, sequins and trim to cardigan. This has been a hobby of mine for many years but on a very off and on basis. I posted a couple of the my earlier customised cardigans here and here. This is my favourite one I’ve ever designed, assisted substantially by the existence of these beautiful fun beads in Lincraft. It was great fun and I was even a little sad once I finished it but that is ok because I have a number of other designs in the making. To add even more brightness to an already colourful outfit, I decided to show you my new bag which I received courtesy of Tidebuy. The colour is very beautiful, as is the diamond design. The large practical size means it will probably come to work with me a number of times. In other news, I recently came across a site called Cuponation which offers fashion discounts as well as beauty coupons and deals. I love discovering new sites; it’s one of my favourite parts of having a blog and spending so much time on the Internet. I’ve always liked the idea of these coupon codes but have never known where to find these deals. I even noticed a few of my favourite stores on there like clutch bags for $7 at Colette, 50% off the clearance section at Florsheim and 70% off wallets at Strandbags. I look forward to making use of these codes and doing some shopping soon. I like to share these discoveries with you. 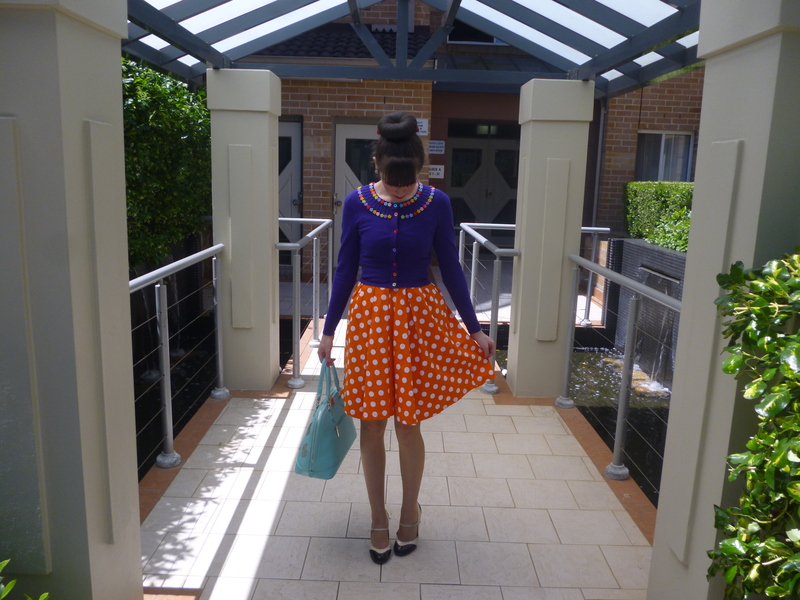 This entry was posted in Custom Made, Customised, DIY, Review Australia, Wittner. Bookmark the permalink. I am always so envious of your beautiful wardrobe. Love it. I'm a big fan of orange. It doesn't great things to my skin tone. That's a very pretty dress and you look beautiful! so beautiful outfit sweetie!! love all these colors! amamzing! How lovely! I really like the polka dot dress! Your dress is so pretty Tia! 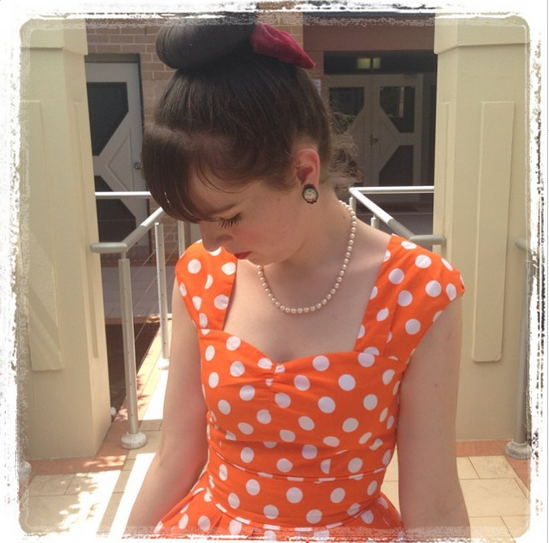 I love orange and I love polka dots. The trim on your cardi reminds me of candy. 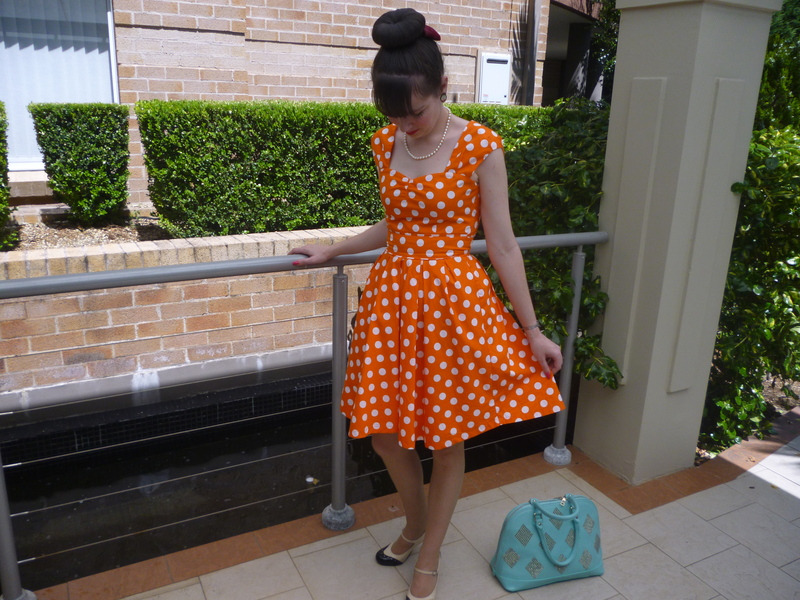 Lovely post, this orange dress is great! Have a happy Halloween! Beautiful dress! I love the colors of this outfit, so pretty. I LOVE this! 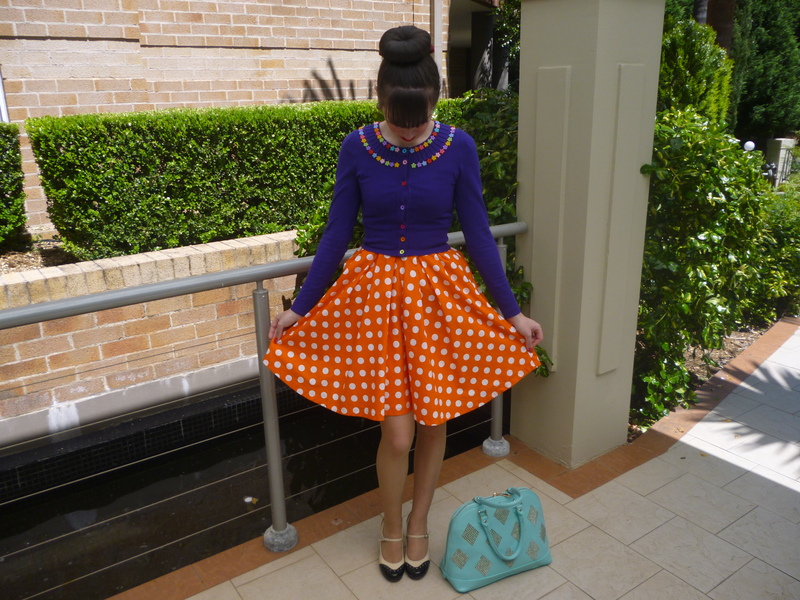 The orange polka dots are so fabulous with your embellished sweater! Great DIY! I love the bag and shoes, too, totally chic and unique! Love how you customized that cardigan! This dress is lovely!! It has a fun and vintage vibe! Orange is a great color on you! I love bright, so I can't complain. Great look on you. That orange dress is so pretty on you! 🙂 I don't have many orange pieces in my wardrobe either, but it is a very fun colour to wear. It's fantastic paired with navy too. 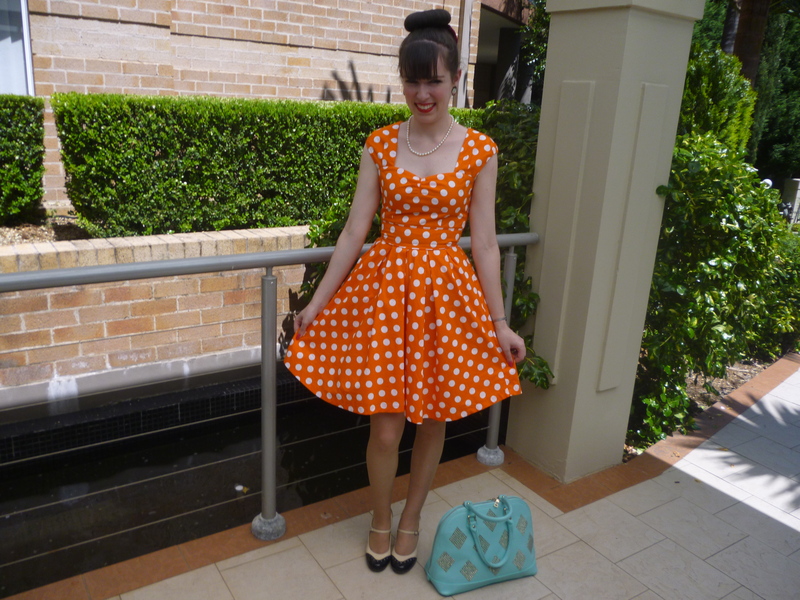 great polka dot dress! fun!!!! thanks for coming by my blog! following YOU from now on!!! The dress is so pretty! And the colour and design are perfect for autumn. 🙂 The customized cardigan is really cute, can't wait to see some of the projects you're currently working on! 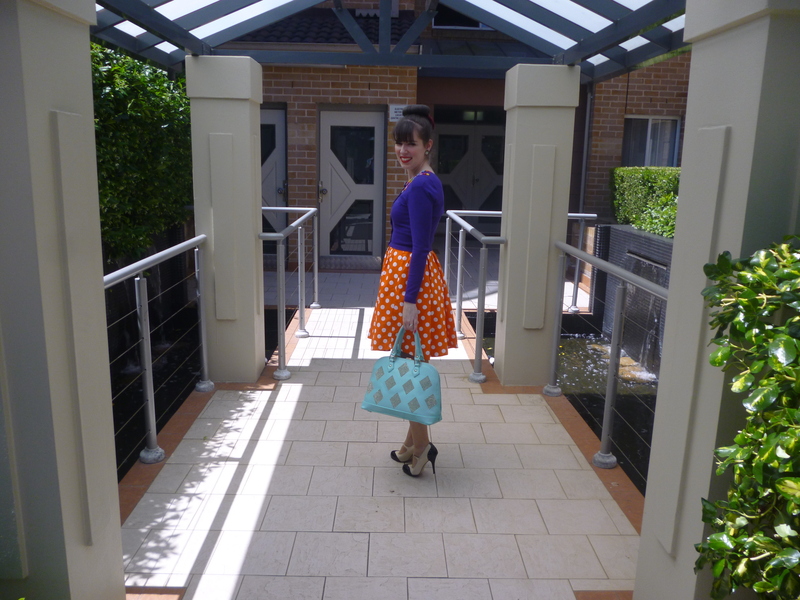 Oh my gosh, I love this polka dot dress! Orange does it for me every time. You look wonderful, Imogen.